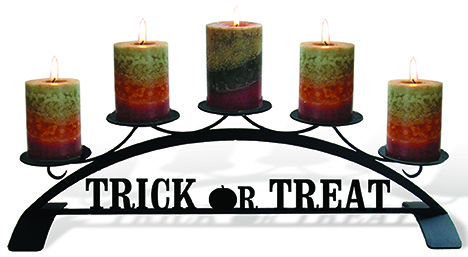 Our pillar candle holder with the Halloween, Trick or Treat, design is created of wrought iron and has a baked-on powder coat finish. Holds five 2 3/4" Pillar Candles. Candles Not included. This American made wrought iron pillar candle holder is handcrafted in Fabius, New York, by Village Wrought Iron.